If you do labs in your science classroom, you are probably aware of the difficulties dealing with make-up lessons. This year, I have a class where half of the students are chronically truant. I have started creating “storylabs” where students who miss the lab experience can read about what happened and examine the data or images that they missed. 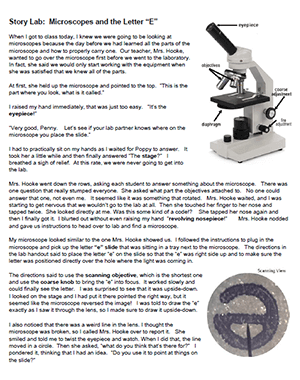 This Storylab aligns with a basic microscope lab where students learn the parts of the microscope and locate the letter “e’ on a prepared slide. Following the directions, they focus the letter using the scanning objective, the low power objective, and finally the high power objective. The lab experience also includes some time and freedom to explore other prepared slides, such as insect parts or dog hair. Students really do enjoy looking at slides, but many lack the patience to learn how to properly focus. The “E” lab provides guidance to walk through the steps needed to use the high power lens. Obviously, the real lab experience is preferred, but sometimes just not possible. In the past, I would often assign an article to read or some other related work for students to make up the points for the lab. The storylab method allows students to read about the experience they missed. I also hope this might encourage more students to come to school so they don’t miss all these amazing labs. Storylabs were designed for an introductory biology class, mainly freshman and sophomores, but they could be adapted for other grade levels. Stay tuned for storylabs on other basic biology experiments!